In 1916, Dr. E.B. Cragin delivered an address entitled "Conservatism in Obstetrics" to the Eastern Medical Society of New York in which he coined the phrase "Once a caesarean, always a caesarean." For most of the twentieth century, doctors followed this dogma believing that once a woman delivered by C/S she should deliver all future pregnancies by repeat C/S. Clinical studies starting the 1960s, however, concluded that this practice was not always necessary. In 1980, the National Institutes of Health (NIH) Consensus Development Conference Panel questioned the necessity of routine repeat Cesarean Section. After extensive research, the panel made recommendations regarding the VBAC. Their recommendations gave support to the practice of the TOLAC and successful VBAC with a significant rise in the number of attempted VBAC from the 1980s through 1996. A major turning point occurred in 1996 with a study published in The New England Journal of Medicine (MacMahon et al, 1996) which concluded that a vaginal delivery after previous C/S (VBAC) was associated with an increased maternal complications as compared to the Elective Repeat Cesarean Section (ERCS). The American College of Obstetrics and Gynecology (ACOG) subsequently issued guidelines in its 1999 Practice Bulletin which recommended that "VBAC should be attempted in institutions equipped to respond to emergencies with physicians immediately available to provide emergency care." (ACOG, 1999) This practice bulletin also recommended that a physician "capable of monitoring labor and performing an emergency cesarean delivery" be "immediately available throughout active labor," and that anesthesia and personnel for an emergency cesarean be "available." Logistical and professional liability issues led many hospitals to restrict or prohibit the practice of VBAC. As a result, the rate at which VBAC was attempted fell from 26% in the early 1990s to less than 10% today. Figure 1. Rates of Total Cesarean Deliveries, Primary Cesarean Deliveries, and Vaginal Birth After Cesarean (VBAC), 1989 to 2007. Data from the National Center for Health Statistics. Figure 2. 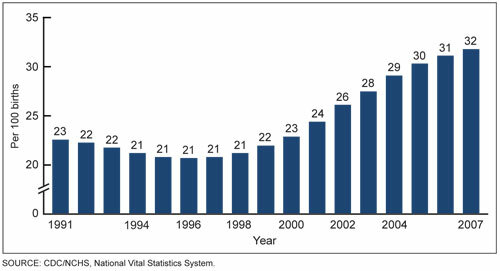 Increasing Rates of Cesarean Section, 1991 to 2007. Data from the US Department of Health and Human Services. Figure 3. Cesarean delivery rates by age of mother. United States, 1998, 2000 & 2007. Data from the US Department of Health and Human Services. In March 2010, the National Institutes of Health (NIH) hosted its Consensus Development Conference on the subject of VBAC and concluded, "Given the available evidence, trial of labor is a reasonable option for many pregnant women with one prior low transverse uterine incision.". Also in March 2010, the U.S. Department of Health and Human Services (HHS), Agency for Healthcare Research and Quality (AHRQ) reported that VBAC is a reasonable and safe choice for the majority of women with a history of prior C/S and that there is emerging evidence of serious harm relating to multiple Cesarean Sections. In July 2010, The American Congress of Obstetricians and Gynecologists (ACOG) similarly revised their own guidelines to be less restrictive of VBAC, stating, "Attempting a vaginal birth after cesarean (VBAC) is a safe and appropriate choice for most women who have had a prior cesarean delivery, including for some women who have had two previous cesareans." "Given the available evidence, trial of labor is a reasonable option for many pregnant women with one prior low transverse uterine incision. The data reviewed in this report show that both trial of labor and elective repeat cesarean delivery for a pregnant woman with one prior transverse uterine incision have important risks and benefits and that these risks and benefits differ for the woman and her fetus. This poses a profound ethical dilemma for the woman as well as her caregivers, because benefit for the woman may come at the price of increased risk for the fetus and vice versa. This conundrum is worsened by the general paucity of high-level evidence about both medical and nonmedical factors, which prevents the precise quantification of risks and benefits that might help to make an informed decision about trial of labor compared with elective repeat cesarean delivery. We are mindful of these clinical and ethical uncertainties in making the following conclusions and recommendations. One of our major goals is to support pregnant women with one prior transverse uterine incision to make informed decisions about trial of labor compared with elective repeat cesarean delivery. We recommend clinicians and other maternity care providers use the responses to the six questions, especially questions 3 and 4, to incorporate an evidence-based approach into the decision-making process. Information, including risk assessment, should be shared with the woman at a level and pace that she can understand. When trial of labor and elective repeat cesarean delivery are medically equivalent options, a shared decision-making process should be adopted and, whenever possible, the woman's preference should be honored. We are concerned about the barriers that women face in gaining access to clinicians and facilities that are able and willing to offer trial of labor. Given the low level of evidence for the requirement for "immediately available" surgical and anesthesia personnel in current guidelines, we recommend that the American College of Obstetricians and Gynecologists and the American Society of Anesthesiologists reassess this requirement with specific reference to other obstetric complications of comparable risk, risk stratification, and in light of limited physician and nursing resources. Health care organizations, physicians, and other clinicians should consider making public their trial of labor policies and VBAC rates, as well as their plans for responding to obstetric emergencies. We recommend that hospitals, maternity care providers, health care and professional liability insurers, consumers, and policymakers collaborate on the development of integrated services that could mitigate or even eliminate current barriers to trial of labor. We are concerned that medical-legal considerations add to, and in many instances exacerbate, these barriers to trial of labor. Policymakers, providers, and other stakeholders must collaborate in developing and implementing appropriate strategies to mitigate the chilling effect the medical-legal environment has on access to care. High-quality research is needed in many areas. We have identified areas that need attention in response to question 6. Research in these areas should be given appropriate priority and should be adequately funded - especially studies that would help to characterize more precisely the short-term and long-term maternal, fetal, and neonatal outcomes of trial of labor and elective repeat cesarean delivery."